Learn how to set up Tuition Express and your check-in computer, so families may make payments through the check-in screen. Make sure you are on version 10.2.4461 or higher. If not, just download the latest Online Update. You must be registered for Tuition Express. You’ll need a credit card reader, such as the one integrated with the Procare Touch Computer, or order a USB card reader separately from Tuition Express. Download the Tuition Express Configuration Assistant and confirm your settings include the following (see image below). If you make any changes, click Update > Exit. 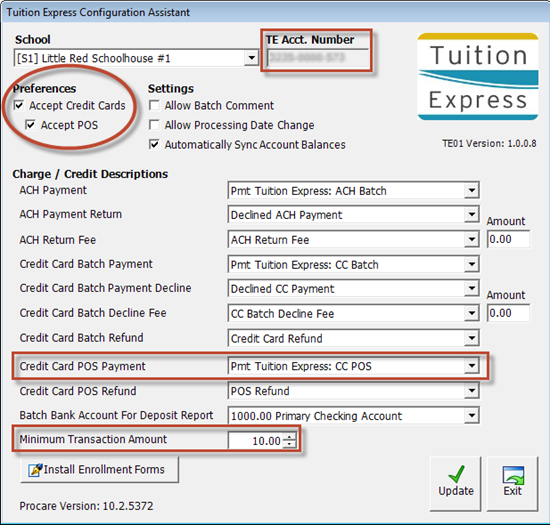 Your Tuition Express Account Number must be entered. Accept Credit Cards and Accept POS must be checked. Choose a Credit Card POS Payment Description. Enter a Minimum Transaction Amount. The Payer must have an email address on their Person Information screen. This is necessary to email a receipt. The Payer must be Registered for Checking In. Note: Even if they are not marked as a pickup person (on the Child Relationships screen), they can still register, but will be limited to making payments; they will not be able to check children in/out. At the Check-In Options screen place a in the Allow Payments box (near the bottom). To simplify the menu options for payers, we also suggest you do not display accounting in the Family Data portion of the setup. 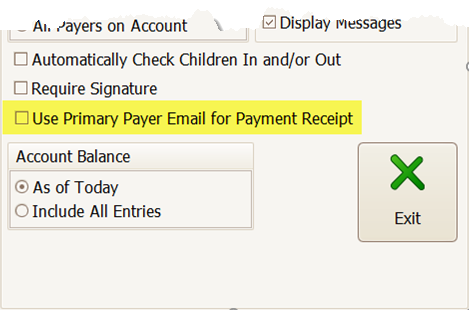 If you want payment receipts emailed to the Primary Payer (instead of the email address of whoever pays the account that time), check the Use Primary Payer Email box.